Author: Jones, Chris Set In . . . Description: On February 1, 2003, the nation was stunned to watch the shuttle Columbia disintegrate into a blue-green sky. Despite the numerous new reports surrounding the tragedy, the public remained largely unaware that three men, U.S. astronauts Donald Pettit and Kenneth Bowersox, and Russian flight engineer Nikolai Budarin, remained orbiting the earth. With the launch program suspended indefinitely, these astronauts, who were already near the end of a fourteen-week mission, had suddenly lost their ride home. 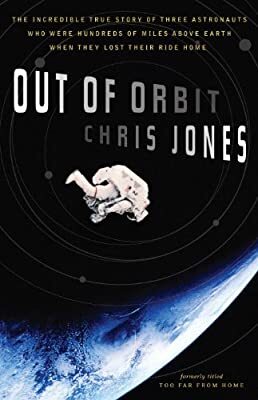 Out of Orbit is the harrowing, behind-the-scenes chronicle of the efforts of beleaguered Mission Controls in Houston and Moscow who worked frantically against the clock to bring their men safely back to Earth, ultimately settling on a plan that felt, at best, like a long shot. Given that no shuttle could come for them, the astronauts’ only hope for a return flight became a Russian-built Soyuz TMA-1 capsule, latched to the side of the space station—a piece of equipment roughly the equivalent of a “padded box attached to a parachute,” with a troubled history (in 1971 a malfunction in the Soyuz 11 capsule left three Russian astronauts dead) and dated technology. Gripping and faced-paced, Out of Orbit is an adventure in outer space that will keep you on the edge of your seat. In a day and age when space travel is poised to become available to masses, Out of Orbit vividly captures both its hazardous realities and soaring majesty.